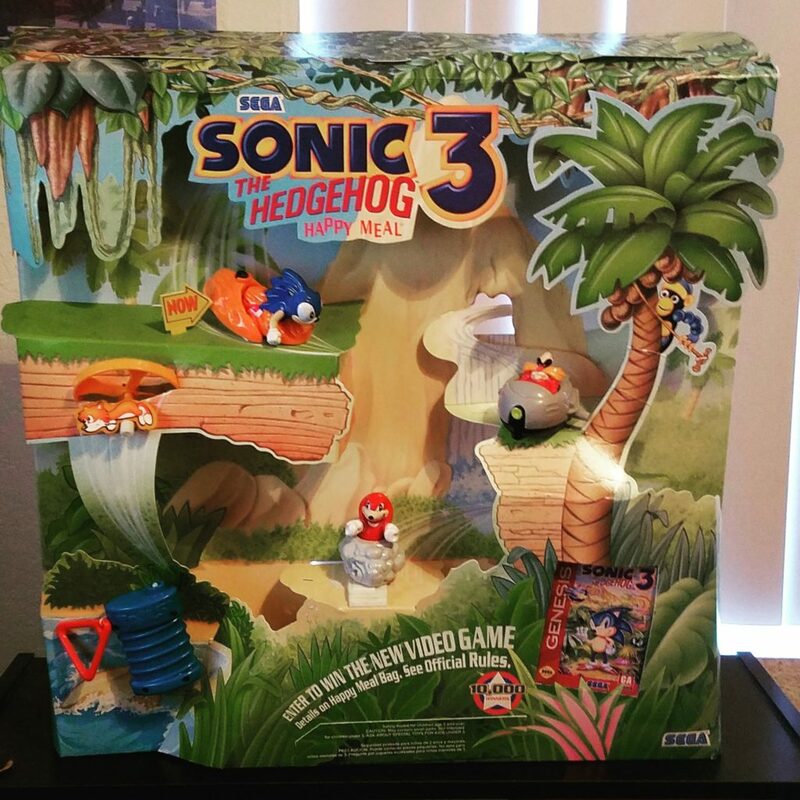 The toy set included a spring-loaded Sonic, a flying Tails, a wind-up Dr Robotnik in his Egg-o-matic, and Knuckles with a whirlwind punch action. A fifth toy, an alternative in the form of a yellow ball with a picture of Sonic on it, was also available upon request for children under the age of 3, for whom the spring-loaded toy was inappropriate for (these were generally not advertised and as such have become the rarer toy of the collection). The promotion ran into problems, however. It was initially planned to run for a total of four weeks, with a different toy given away each week, yet only two weeks into the promotion, the entire stock of 40 million toys produced had been exhausted, such was the demand for the toys. It took nearly a year for the same promotion to travel across the Atlantic to UK and European branches of McDonalds, which coincided more with the release of Sonic & Knuckles, and included a few changes to the US offering. The Tails toy had been modified to have it’s flying action removed for safety reasons (undoubtedly Tails had flown into one to many faces in the US) and instead had rotating tails operated with a pull strip. 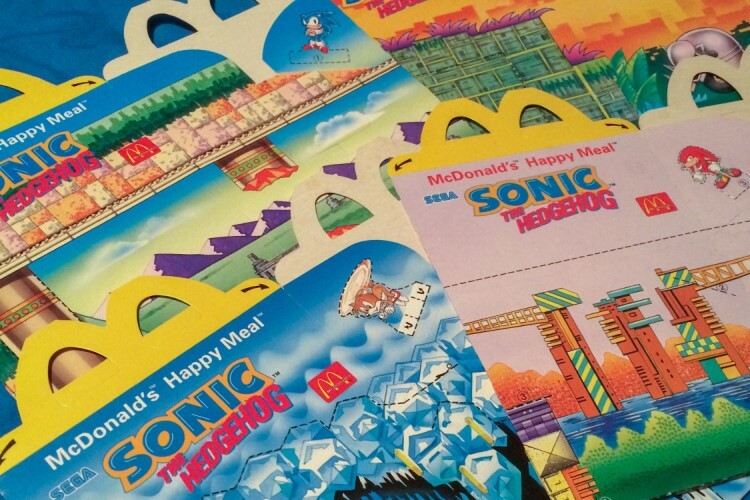 The Happy Meal boxes in the UK were illustrated with artwork based on the backgrounds of Angel Island, Marble Garden, Ice Cap, and Launch Base Zone. In Japan, Dr Robotnik’s model in the Egg-o-matic was replaced with the Dr Eggman model, removing the less-familiar westernised design for the Japanese market. Oddly, the Tails toy was completely omitted from the line in Japan, and instead replaced with Grimace (the weird purple monster who hangs around with Ronald McDonald). 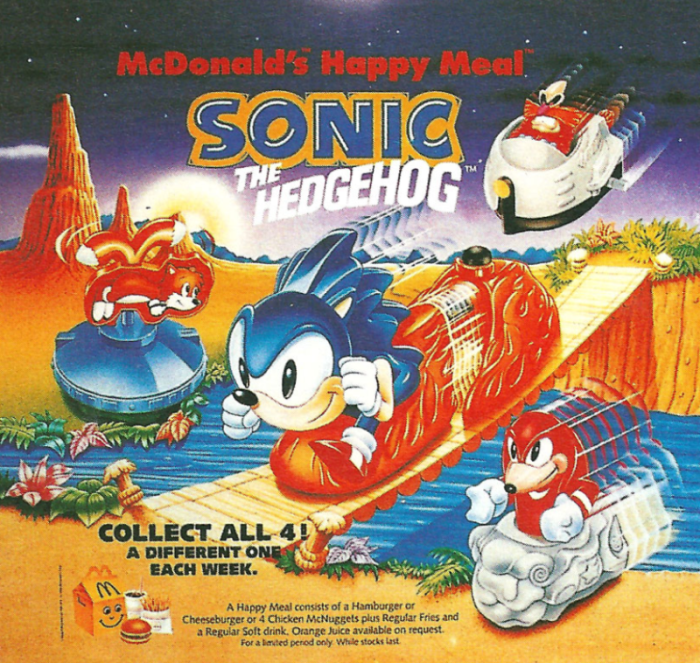 While the McDonalds Sonic 3 promotion wasn’t either the first or last Sonic-themed fast food outing, it was by far the most popular! Do you have any fond memories of the Sonic 3 McDonalds promotion? Let us know in the comments! Do I have memories of this? Yes! In the USA, we didn’t have ANY Tails toys, unless you were lucky enough to find a Caltoy Tails plush. It really sucked if you were a Tails fan. Anyway, when I finally got the Tails toy in my happy meal, I was so happy! I played with it all the time, so much so that the sticker on one of the sides just fell off of it one day at the park. I started crying and my mom told me we could go back to McDonald’s soon to get another one. When we went back to McDonald’s, I asked the clerk if I could have a Tails. She told me that McDonald’s had recalled it. Then I started crying. About a year later, I found another Tails toy at a flea market. But yeah, I’d play with these toys during the commercial breaks of Sonic SatAM. It was fun. Also, the Tails doesn’t fly as high as they make it out to in the commercial. That was like two or three years before I was born, but I have fond memories of the LCD games. Even when I tried collecting them all, I think was missing one, funnily enough the Billy Hatcher one (which I didn’t care about) I found it lying on some table in a random place, it must have been there for some time because the plastic got a little melted but hey it still worked and the artwork was intact. That’s one of the best parts of the LCD run, the Sonic ones had Sonic Heroes art and it was awesome to see (at least back then) that kind of art outside the game. The second part was that many of the kids in my class had them, I remember being amazed at the translucent Tails one. Definitely the best one. Ah man I remember these! Still got them at my mom’s house, haha. I don’t think I ever got the Tails one, but definitely have the rest. I have the Knuckles and Sonic toys that I got as a birthday present from my cousin since she knows that I am a Sonic fan. So I guess I am a lucky owner of two rare toys that I didn’t know was rare before now! 4) The fact that the tails toy in the ad is not only just a flat image of tails, but just GOES UP immediately and NEVER comes back down is such a hysterical image to me?? Like, imagine being so happy to get Tails, and then you find out it’s flat. But that’s disappointing, yet it’s still Tails, right? Yay! So you decide to try it out– and it just ascends. And you never see it again. And they do it en masse as a flock. AND WHY GRIMACE?? Imagine Sonic and Grimace! The version of Sonic 2 we luckily never got in this reality.